There are times when great things start by accident. Or shall I say, serendipity, as my high school chemistry teacher often said to describe an important accidental science discovery. Walter Wick's career as a children's author did start unexpectedly one day when he was sorting screws, bolts, and various other odds and ends on his light table. Immediately, the trained photographer took notice to the items that lay in front of him and spent hours arranging them. He snapped a picture of the final arrangement for his portfolio. It was this shot that landed him a job designing and photographing objects for posters sponsored by the Scholastic magazine, Let's Find Out. 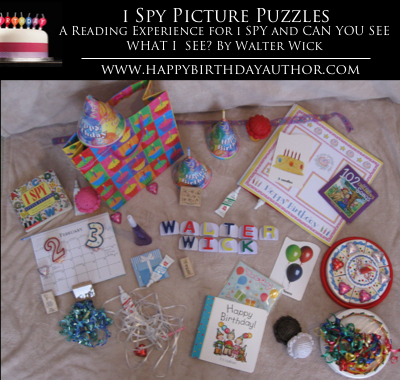 After a successful line of posters the editor of the kindergarten magazine, Jean Marzollo, and Walter Wick teamed up to create the iSpy Series of books. Over the years, the series has sold over 36,000,000 copies and won numerous awards. There is even an HBO TV Show and iPhone Apps based upon the book series! Walter Wick is more than just the co-author of the iSpy Series. He is the sole author of the Can You See What I See? Series . 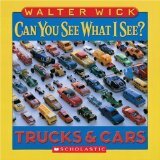 This series of books feels like the iSpy series, but moves more to Walter Wick's roots as a creator of picture puzzles. Early in Walter Wick's career he created picture puzzles and covers for Games Magazine. Many of the scenes in the Can You See What I See? Series are elaborate models that are constructed then ladened with hidden objects. Walter Wick uses his knowledge of photography to capture the perfect image. After some editing and final tweaking a rhyme is added to form the puzzle. I think it would be interesting to find out from your children or students which series they prefer best. The littlest kids might prefer the Seymour, Can You See What I See? Series . Jean Marzollo, the co-author of the iSpy Series , was once emailed by a teacher who was outraged by the school's librarian would not let the students of the school check out iSpy books. The librarian believed the books lacked of educational value. Jean responded by developing a teacher's guide to point out how the books are extremely educational and packed full of learning concepts. The iSpy book that I think is most packed with educational concepts is iSpy School Days . There is a picture puzzle that focuses on the alphabet and another on numbers. There are subjects such as science, reading, spanish, art, social studies, and drama infused into many of the puzzles in this book. Probably the coolest picture puzzle in the book is called Balloon Popper. Walter Wick has a video on his website that documents the success of the contraption. This week I really watched how my kids interacted with the iSpy and Can You See What I See? books. I thought I would first talk about some observations I had from watching my two year old son. This was his first experience with the books and interacted with them more than I would have thought. He gravitated to the books whether they were lying open on the living room floor or even if the books were unopened on the chair. At times he even would independently tell me things that he saw in the pictures. We also spent a lot of time looking at the books together. We identified colors, found animals, and just talked about things we saw in the picture. Most of the time finding the objects that were supposed to be found through the rhyme were too hard for him to locate. Instead, I would just ask him to tell me things that he saw. I would also pick out items not necessarily in the riddles that I knew he would be able to find. Jean Marzollo said, as long as you have "visual discrimination and the vocabulary" you can enjoy iSpy. My four year daughter had interacted with the books before, specifically iSpy Spooky Night , last Halloween. We tried to figure out the riddle rhymes together. She did quite well finding objects that fit her vocabulary. I always hesitated to say I found an item to quickly, because I wanted to give her an opportunity. However, she really liked when I helped because it meant we were that much closer to finding all the items. She did get frustrated on quite a few occasions. I was afraid that she might be turned off by the books if they were too hard. Therefore, we started to look at the picture and talk through what we saw before we started the puzzle. This helped her navigate through the page and seemed to lower her frustration because she wasn't overwhelmed. I decided we needed to try to make our own picture puzzle. I thought about about how to accomplish such a task with my family. I thought it would be best to first settle on a theme. The easiest for us was Walter Wick's birthday. I then sat down with my daughter and made a list of all the things you need to have a birthday party and then we searched the house for those items. My wife and two kids arranged all the items on a blanket in the living room and I took the picture. Lastly, we came up with the riddle rhyme. It didn't take us very long and I was quite pleased with the results (Click here to see a larger version of the photo). You could do this activity with any theme that you want (i.e. toys, animals). Walter Wick describes in one of his videos on his website that he hopes he inspires children to create and construct scenes and models. He feels it is the creative play that is most important and the final picture is just a way to document what you have accomplished. You may be surprised with what your kids or students come up with when given a little structure and guidance with this activity. Jean Marzollo has posted on the iSpy website pictures of various projects school children have completed. There are two other Walter Wick books that are worth mentioning, A Drop of Water and Walter Wick's Optical Tricks . A Drop of Water is a book about the science of water. It has stunning pictures which help explain the many properties and behaviors of water. There is a section on snowflakes that might be fun to explore. I did not read this book to my kids, but they enjoyed looking at the photographs of actual snowflakes. Walter Wicks' Optical Tricks is a book that takes optical illusions that many of us have seen but Walter shows them in a new way through photography. I think I had as much fun as my kids this week searching through the books. I found myself picking up the books after the kids went to bed. I also learned quite a bit by looking through all the pictures and videos Walter Wick has provided about his books on his website. Check out the links below. Start planning a vacation: Check out, Walter Wick: Games, Gizmos, and Toys in the Attic Exhibit at The Walters Art Museum, Baltimore, MD- Sept. 18, 2010 - January 2, 2011. 1. Walter Wick's Website - Full of behind the scenes photos for many books! 4. Walter Wick's Facebook Page - Become a Fan! 5. Walter Wick Studio Channel on YouTube - Great Videos! 9. Jean Marzollo's Facebook Page - Become a Fan!